1. Suddenness; unceremonious haste or vehemence; as, abruptness of style or manner. 2. 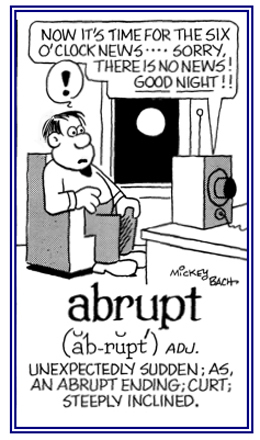 The state of being abrupt or broken; craggedness; ruggedness; steepness. To reduce the corrosive impact of corruption in a sustainable way, it is important to go beyond the symptoms to tackle the causes of corruption. Since 1996, the World Bank has supported more than 600 anticorruption programs and governance initiatives developed by its member countries. "Indian anti-corruption leader organizes mass rally. Thousands of people have poured into the streets in various Indian cities to support Mr. Hazare and his campaign to create a new, independent anti-corruption agency with powers to investigate governmental officials." The Global Edition of the New York Times August 19, 2011; page 5. 1. A debtor who, upon voluntary petition is judged to be legally insolvent. The debtor's remaining property is then administered for the creditors or is distributed among them: "Jim's father became bankrupt and the family had to sell their house so they could pay the unpaid dept." 2. Any insolvent debtor; a person, or organization, that is unable to satisfy any justified monetary claims made upon it: "As a result of being bankrupt, the company went out of business." 3. A person who is totally lacking in a specified resource or quality: "Jerome was considered to be intellectually bankrupt." 4. Etymology: from Italian banca rotta, from banca "moneylender's shop"; litterally, "bench" + rotta "broken, defeated, interrupted" from (and remodeled on) Latin rupta, past participle of rumpere "to break". The original meaning in Italian was the ruin or breaking up of a trader's business because of his failure to pay creditors, or the abandonment of business to avoid paying debts. The modification of this sense to mean "an insolvent person" is peculiar to English. In medieval times, Italian moneylenders used a small bench in the markeplace to conduct their business. The Latin word for such a bench, banca, is in fact the source for the English word bank. These money lenders, the "bankers" of their day, were required to break up their benches if they failed in business. The term bankrupt appeared in 1543 and was borrowed through Middle French banqueroute, and directly from Italian banca rotta, "bankruptcy" (literally, "bank broken"; rotta from rompere, "to break", from Latin rumpere, "to break"; the modern form -rupt is an alteration of Medieval Latin ruptus, "broken", and as a noun meaning "a bankrupt"), later became the English word bankrupt. 1. To cause to become financially insolvent: "The officials have been bankrupting their company with excessive spending and inadequate sales to cover those expenses." 2. To ruin: "The newspaper had an administration that bankrupted its credibility by seeking to manipulate the news." 1. A person or organization that is legally declared incapable of paying is financially owed to another person or group. 2. A lack of resources; the complete lack of a particular quality; especially, good or ethical qualities; moral bankruptcy. 1. Pertaining to having been legally declared financially insolvent: "The new business was existing in a bankrupted condition and would have to get a new loan if it were to continue." 2. A reference to being depleted of valuable qualities or characteristics: "The senator turned out to be a morally and ethically bankrupted politician." 3. Characteristic of being totally depleted; destitute: "Jerome was bankrupt of new ideas for the project." 4. Relating to being in a ruined state: "The country had in a bankrupted foreign policy and a bankrupted economy." Referring to being financially ruined and impoverished: "The bankruptive situation that Josh was facing made it impossible for him to pay for his university education." Unsound or rotten as if something is broken down or ruined: "The corrupt city officials looked the other way when public workers were taking bribes." Related break, broken-word units: clast-; frag-.